When the court rules against you. 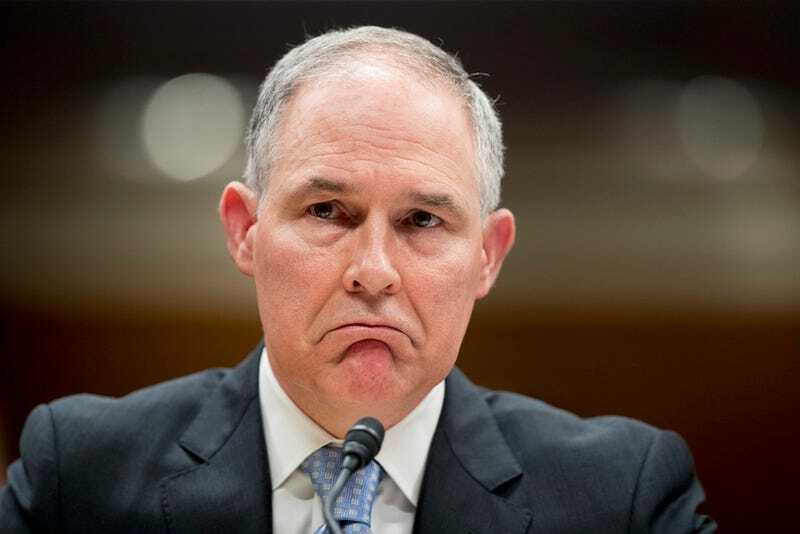 Area scandal lover Scott Pruitt is a man known for saying many dumb things about climate change. Now he’s being compelled to say where he gets his information from, and it could be very revealing. There is not “tremendous disagreement” about the degree to which humans are influencing the climate. In fact, our greenhouse gas pollution is the primary driver of “the global warming that we see.” Pruitt’s statements are completely at odds with reality, including science published by the agency he runs. “If the head of the EPA goes on a TV show in his role as the top administrator for the nation’s environmental agency and says that human activity does not contribute to global warming, the public has a right to see what agency records he relied on to reach his conclusion,” Sarah Lamdan, a FOIA expert at CUNY, told Earther. Thus was the thinking of PEER, which filed a FOIA asking exactly where Pruitt got that information from. The EPA has stonewalled them (as it has stonewalled many public records requests under Pruitt), claiming some of the information was unknowable and not in the public interest. So, PEER took them to court. “Forcing FOIA requestors to resort to court battles like this one wastes government time and money, and creates an uneven playing field where only people with the means and expertise to tangle in the courts over FOIA requests will ever get the records that the law is meant to ensure access to,” Lamdan said. Of course we already know there is no evidence to back up Pruitt’s statements. We do know, however, that the EPA landing team was stocked with climate deniers from conservative think tanks and that the ranks of political appointees are full of lobbyists and lawyers who have worked with the fossil fuel industry. Getting records of their climate conversations with Pruitt be damning. On the other hand, the EPA coming back empty handed would further illustrate how science is being sidelined for ideology at the agency.